Lush Fab Glam Inspired Lifestyle For The Modern Woman: Get Ready For Spring With These Fab Deals. Get Ready For Spring With These Fab Deals. Welcome March! We couldn't be happier to see the end of the winter season although you can't tell that Spring is on its way from the cold temperatures and one too many snow storms but we won't let that put a damper on our spring spirit. Are you ready for some Spring cleaning? 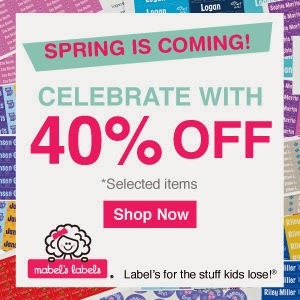 Mabel's Labels is helping you get organized by offering 40% off Sticky Labels , Skinny Minis, Tag Mates and the Big Kaboodle Combo. Plus receive free shipping on all orders until March 4th 2014. This post is brought to you by Mabel's Labels. All opinions are mine. Don't forget to share this fab deal using the buttons below.